The White House has joined other international voices in urging Benghazi-based renegade General Khalifa Haftar to halt his ongoing assault on the country's capital — this as the United Nations-backed Government of National Accord (GNA) in Tripoli has already spent days battling Haftar's Libyan National Army (LNA), which has included the use of air power. And additionally Pompeo stated, "There is no military solution to the Libya conflict" — an absurd and ironic line for a top US official, given it was the US-NATO led 2011 war on Libya's Gaddafi that plunged the country into years of internecine civil war and violence in the first place. “A political solution is the only way to unify the country and provide a plan for security, stability and prosperity for all Libyans,” Pompeo said further. Over the weekend US Africa Command said it was withdrawing a small contingency of Marines in Libya due to “security conditions on the ground.” US forces had reentered Libya in larger numbers during a 2016 campaign to oust ISIS terrorists from their stronghold in Sirte (notably Sirte had been Gaddafi's favored town and the place of his execution at the hands of NATO-backed Islamists). "The security realities on the ground in Libya are growing increasingly complex and unpredictable," said AFRICOM commander Marine Corps Gen. Thomas Waldhauser, announcing the move. "Even with an adjustment of the force, we will continue to remain agile in support of existing U.S. strategy." 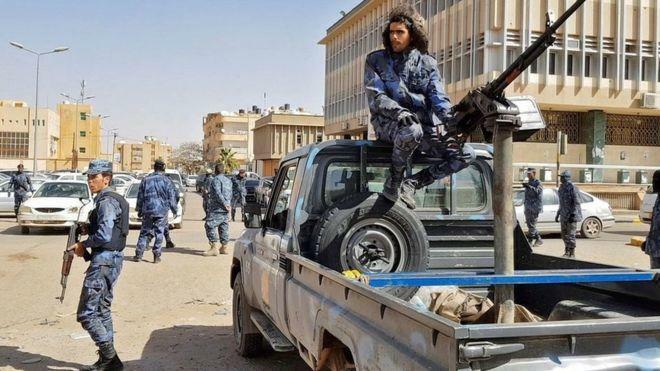 Haftar - who solidified control of Eastern Syria and swept through the south in January, seeks to capture Tripoli and seize military control of the entire country, after his LNA captured a section around Tripoli's international airport. As we noted earlier Sunday, some international reports confirmed that the LNA gained full control of the airport later in the day Saturday, but other conflicting reports say that this was premature, which could mean only a section what's called the "old airport" was wrested from Tripoli forces — not the operational international side. Video purporting to be from the inside the Tripoli airport was posted on social media Saturday. The renegade general, who for about two decades previously lived in exile in the US a mere few miles from CIA headquarters in Virginia, is unlikely to halt the assault, which has the UN fearing a new major war that could further rip Libya apart. #Libya- video of LNA fighting near Khallet Alforjan, Ain Zara, outskirts of #Tripoli. One political commentator and historian, Gerald Horne, placed the latest events within the context of the prior NATO intervention: “You may well expect a bloodbath to unfold in Tripoli. Which is quite tragic and unfortunate, but I’d say it’s the inevitable outcome of the ill-advised attack by NATO, led by the US, that resulted in the 2011 overthrow of Gaddafi,” he told Russia's RT. Based in Libya's oil-rich east, Haftar's militia has already captured much of the country's oil resources, especially after a successful blitz to take much of the south over the past year. And now he stands ready to take the capital of Tripoli in the west — home to Libya's state-run National Oil Corporation, which when combined with small subsidiaries under its direction accounts for some 70% of the country's oil output. Bloomberg's Salma El Wardany considers the potential impact on global oil markets and asks, will this impact oil exports? the terminal, he will virtually control Libya’s oil industry. Prior the 2011 Libyan war and NATO military intervention which ultimately led to the overthrow and killing of longtime ruler Muammar Gaddafi, Libya produced about 1.6 million bpd, but years of turmoil and political instability in the aftermath have slashed that to 550,000 barrels per day as of 2018 output numbers.